When it comes to the career of Roger Corman he’s quite legendary in B-cinema and while he has plenty of directing credits its as producer that he’s most prolific. To most Corman is just some guy that produces B-films, but I don’t think people realize the impact that Roger Corman made not just in B-cinema, but film as a whole. It was Corman who launched the careers of many Hollywood superstars and resurrected the career of Boris Karloff. When you produce as many low budget films as Roger Corman has you’re bound to have a whole lot of poor films and since the Hollywood monster grew and grew in the mid 90s the good portion of Corman’s films have been poor (though some are fun in a silly way, but not like those in his prime). While Roger Corman produced some very popular cult films (though not always credited) such as The Big Bird Cage and Women in Cages. While not the first WIP (Women in Prison) films they were the ones that paved the way for what followed. Even in slasher films Corman made an impact with films such as Slumber Party Massacre and of course monster films with films like Humanoids from the Deep. Nobody will mistake Corman’s work for Oscar worthy caliber films, but he is an icon in the film industry even if your average person doesn’t realize it. As I stated he launched the careers of many big players such as Jack Nicholson and Francis Ford Coppola. Back in the 60s when Roger Corman was an active director he actually made some very solid films and not silly B-Movies, which while a lot of fun don’t showcase fully how talented he is. However regardless if the film is good or a so bad its good film there is good reason why Roger Corman’s career has spanned as long as it has. And as I mentioned not making Oscar caliber films, Corman has an Oscar for his achievements in film and while some may disagree, but I think it was very warranted. The Haunted Palace is actually based off the work of H.P. 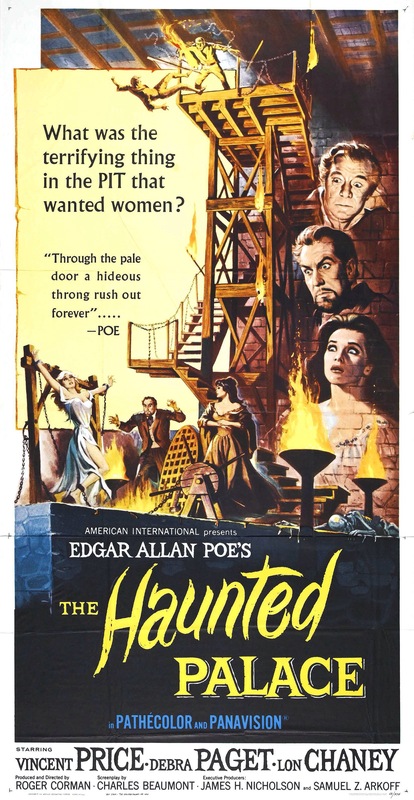 Lovecraft rather than Poe, but there was more marketing in Poe’s name and this was very common in the 60s to have all these films based off the work of Poe, but the film had little or nothing to do with his work. Actually not only the 60s, but even in the 30s with some of the Karloff and Lugosi films based off Edgar Allan Poe stories had nothing to do with them. It’s sort of like the based on a true story, which in reality has very little of the true story its inspired by. Regardless of the fact, The Haunted Palace is an excellent film in the careers of Vincent Price and Roger Corman and while I can’t say for sure its my favorite Price/Corman film it is easily a contender. Joseph Curwen (Price) was an evil warlock that was burned at the stake by villagers, but just before he puts a curse on future generations of the villagers. Now 110-years later Charles Dexter (Price in a dual role) inherits the palace. Curwen possesses the body of Charles and seeks revenge on the ancestors of those who killed him while also trying to bring his dead wife back. 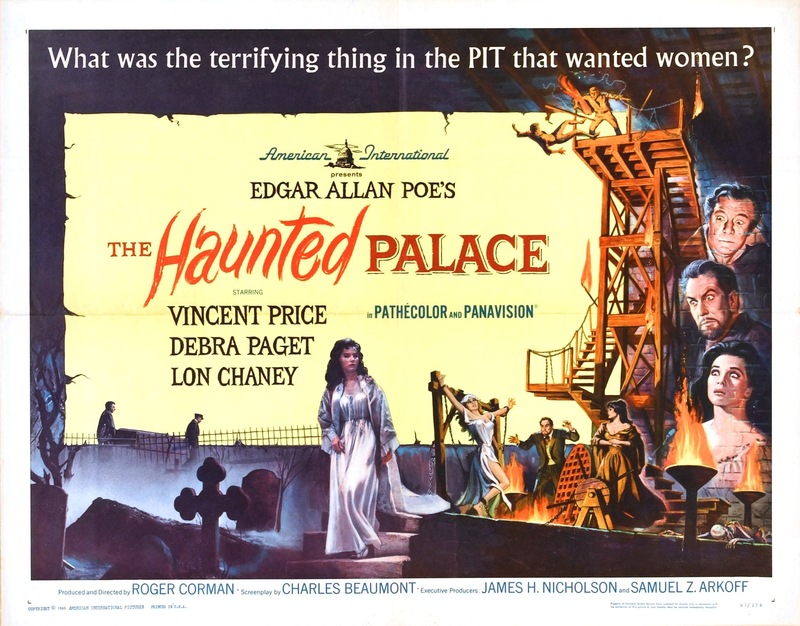 The screenplay by Charles Beaumont is generally well written with solid characters and for the most part the Haunted Palace is well plotted, but certain things just sort of happen with no real explanation, but with that said it never hurts the film. Outside of some minor flaws Beaumont’s script is quite well done. As director Roger Corman shows here he’s more than just campy films. 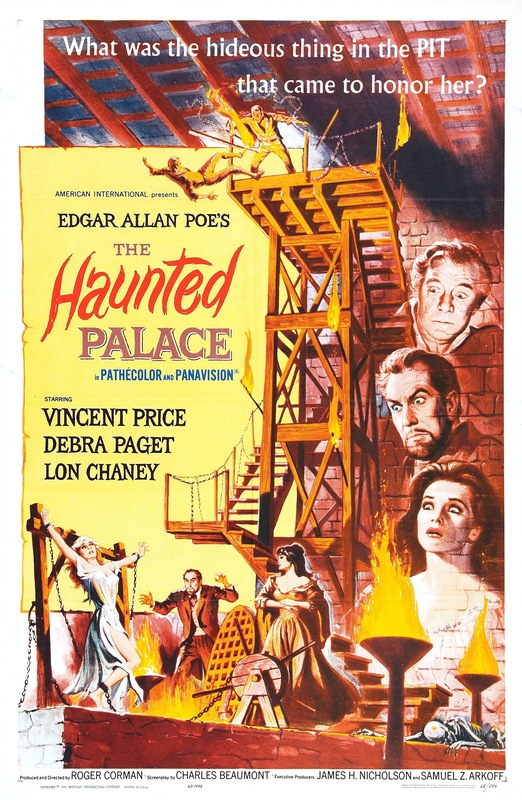 The Haunted Palace is well made with a great an eerie gothic look. Corman delivers a well paced film with plenty of suspense and again eerie atmosphere. As I mentioned Corman is more prolific as a producer and he’s produced some excellent films with many being silly and campy fun, but a lot of his directorial efforts weren’t silly nor campy and he deserves far more credit as a director than he gets. While he may not be on the level of say John Carpenter, Roger Corman in my opinion is still one of the great horror filmmakers. The Haunted Palace is a great showcase for the talents of Vincent Price as he’s equally great as both the villain and good guy. Price was such a terrific actor and is one of the horror genre greats and in many ways reminds me of Boris Karloff as each brought a touch of class to their films regardless on quality of the film and both could play the good guy and villain and be great in each role. It’s always great to see Lon Chaney who was far better than given credit for and while Chaney is seen as a horror icon he was always in the shadow of his father and than later Boris Karloff and Bela Lugosi. I’ve said it before and I’ll say it again I always preferred Chaney, Jr over Sr and I like Lon Chaney, Jr as much as Lugosi (Karloff will always be the king of the genre for me). This film was released when Chaney’s best roles were behind him and this was probably the best film he’s made in years and possibly his last great role. Overall The Haunted Palace is a terrific gothic horror film that has quite a creepy feel with a terrific performance by Vincent Price and Lon Chaney. It’s films like Haunted Palace that really showcase the talents of Roger Corman.